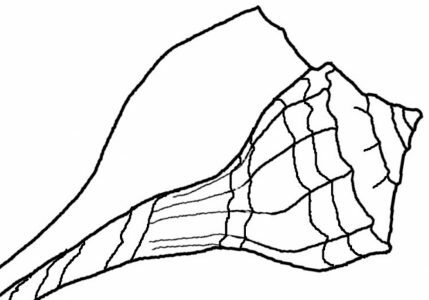 Abalones live where the rocks are, near shore or sometimes in quite deep water, and move around on a large, muscular foot. This is the best reason I can think of for not finding them in Florida – not many rocks. I’ve never seen one here, nor are they mentioned in my seashell ID book. They are collected to use as food and of course the shell is used for it’s ornamental value. 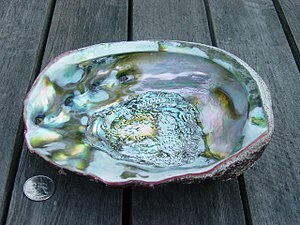 The Red Abalone (Haliotis rufescens) is the largest of the species growing to 12 inches (30.5cm) long. The outer shell is dark, brick red and the inside has a beautiful iridescence. The Abalone is prone to Withering disease that causes it to eat itself which causes the muscular foot they use to hold onto rocks, to wither, which in turn causes them to fall off and eventually starve to death, unless a predator gets them first.